As you know, the teenage years can be some of the best and some of the most tumultuous times. Teens need extra support from their parents. As a result, parents need extra support. Busy schedules and adolescent hormones can make you feel isolated on a lonely island of teen parenting. You need to be equipped to nurture your child and hear you are not alone on this precarious journey. Who do you turn to for help? LuHi’s Thriving Parents group is designed just for you. It is a haven for parents to encourage and strengthen each other; it is a sacred space to pray for one another and the students. The meetings began last spring led by Marty Kohlwey, who is the Director of Campus Ministries and Theology IV teacher. He is also a parent himself, so he knows firsthand that parents need Christian fellowship, prayer and resources to love their children like Christ loves us. The group meets once a month on Monday nights from 7-8:30 and hosts about twenty to forty people. Prior to the meeting, Mr. Kohlwey emails articles about a current topic relevant to teens and or parents. When everyone arrives on Monday night, parents are welcomed with introductions so they can get to know each other by name, age of child, and their child’s activities. People are asked to share a fun memory or answer a humorous question about parenting. The meeting peaks with the most important element: prayer. The parents sit at individual tables, share prayer requests and pray together, which is Mr. Kohlwey’s favorite part. “This is awesome,” he says. “It stirs my heart to see parents sharing prayer requests for their families and then hear them lifting each other up to God.” There is nothing more impactful you can do for your child than to pray for them and to pray for the peers that surround them. “Do not be anxious about anything, but in every situation, by prayer and petition, with thanksgiving, present your requests to God” (Philippians 4:6). So to all LuHi parents: please consider attending the Thriving Parents group. It can give you the help you need to better understand, support, and communicate with your teen. In addition to the Thriving Parents group, everyone is welcome to attend Parents in Prayer every Friday morning from 7:40 8:30 at Parker Bible Church. 4389 Mainstream, Parker, CO 80134. 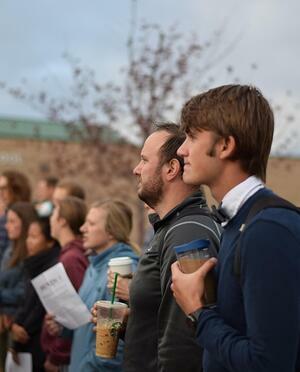 At LuHi, we stand together so we can be stronger together for our students.